We’ve all heard of endorphins, and of the “runner’s high” that athletes experience after a good exercise session. Endorphins are chemicals that are produced in the brain, and produce a feeling of happiness and well-being. Recent research has shown that dogs too experience increased levels of endorphins after exercise which can have positive effects on their behavior. This endorphin rush occurs after high intensity endurance exercise but not after low intensity walking. There are many behavioral problems in dogs that can benefit from increased exercise. Compulsive tail chasing or constant chewing can be your dog’s way of coping with boredom or under stimulation. It’s important to rule out any medical reason for his chewing, such as allergies. If he gets a clean bill of health, then part of his behavior modification program may include medication but definitely should include more exercise. Active “teenage” dogs can be a handful! They’re full of energy and will often challenge their boundaries. They don’t have a problem as such, but their normal behavior can be frustrating. These youngsters benefit greatly from increasing their physical exercise. Obedience training will also give them something to do with their mind. The result is a physically and mentally tired dog, and we all know that a tired dog is a happy dog. 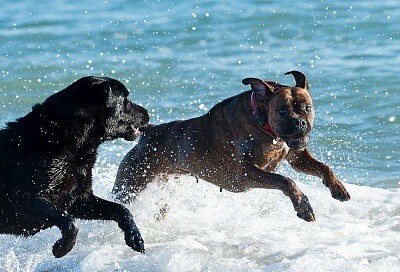 Some dogs continue to be extremely hyperactive even when they have grown out of their adolescent years. If your dog is like this, you’ll know how hard he is to live with, because just watching him can be exhausting. Perhaps he has the canine equivalent of ADHD! Exercise won’t cure his hyperactivity, but it will help to take the edge off so you will be better able to manage him. He needs more than just a walk, he will need to run and run and run. Ideally, tire him out twice a day and you should see him start to relax. If your dog suffers from an anxiety disorder, such as separation anxiety, you’ll need help from a behaviorist to help him to overcome it. Part of his treatment will be medication and a retraining program, but do make sure he gets enough exercise. The endorphins from exercise will help to calm him and he’ll feel less nervous. Lick granulomas are skin lesions that are caused by excessive licking. They are often seen on the front legs, where it’s easy for your dog to reach with his tongue. Although they are a physical condition, the main cause is behavioral. Changes in the environment, such as the arrival of a new family member can be enough to trigger anxiety in your dog, and he tries to ease this anxiety by licking. Working breeds such as the Boxers, German Shepherds, and Great Danes can develop lick granulomas through boredom, because they really need a job to do and this doesn’t often happen in their suburban lifestyle. It is thought that licking triggers endorphin release, and an important part of treatment is to give him that endorphin release through other means. This is where exercise is so important. It can produce the endorphin rush that was previously obtained through licking. There are many ways you can give your dog the type of exercise that triggers endorphin release. This is the obvious and best choice. 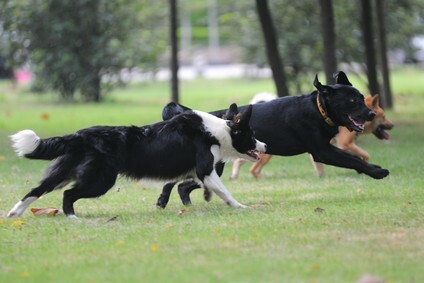 Most dogs are natural athletes and will cheerfully accompany you on a run. Dogs have been known to run marathons, and one dog I know has completed a 74 km trail run. With this capacity for endurance, you can see why a slow stroll around the block just isn’t enough for many dogs. If you’re not a runner, then consider hiring a dog running service, or paying a college student to take your dog out for a 10 mile jog. You can purchase a dog treadmill, but while they do exercise his body, they do nothing for your dog’s mind and are extremely boring. Keep in mind that not all dogs want to run and if you push him into it, there won’t be any endorphin rush and you may in fact cause anxiety. If your dog is ball crazy, then you can throw a ball for him over and over again until he is worn out. This is safest if it is done inside a fenced area such as a dog park or tennis court. When you throw, make it easy and safe for him to catch so you don’t have to deal with any injuries. Agility and flyball aren’t endurance events but your dog will love them and they provide physical and mental exercise. If your dog isn’t a candidate for physical exercise, try feeding him his kibble in a treat ball so he has to move around constantly while he is eating. He’ll also enjoy a game of hide and seek with a toy. While exercise is an important part of managing behavior problems in dogs, it’s not enough. If you just focus on this, you’ll end up with a very fit dog that still has issues. If you combine exercise with retraining and medication if necessary, you’ll have the best chance of a successful outcome. Previous post: Why Does Your Dog Eat Grass?